HA HA HA! 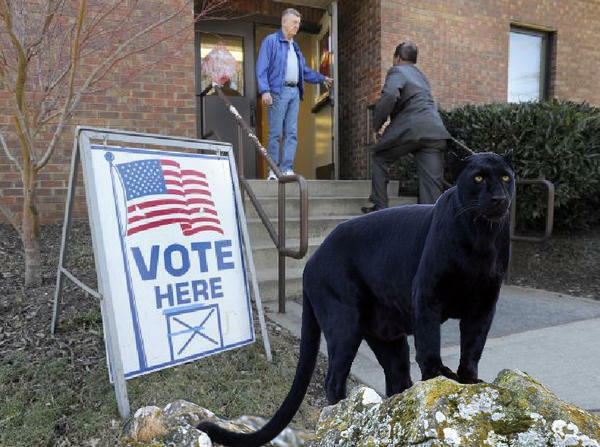 I was just in a GOP chat room (shudder) and they were really up in arms about some black panther guy at a voting station. I tried to find out what it was he did to intimidate any voters and they said it was "just the way he looked". I then saw a photo of him and he was some old, skinny dude with a beret on. Not the most intimidating fella. Anyways, it's his right to be there, just like it would be a KKK members right to be there. Once they actually threaten someone though, they lose that right. Great photo, had me laughing for sure.